What does it take to pull off a 12-day mission, looking at the best ways to work and explore at an asteroid, while dealing with simulated communication time delays between the crew and Mission Control? I don’t know exact number, but it takes many talented and dedicated people. Image at right: Mission control in Key Largo, Fla.
Who are those people? Let’s start back on shore in Key Largo, where there are two teams making sure everything comes together. One team is the Mobile Mission Control Center. They direct the day, providing timelines for when events happen and support for all activities. Also back in Key Largo, we have the Aquarius Reef Base (ARB) team. They run the habitat, keeping it going 24/7. They also provide the training and logistical support for the mission. From their team comes two talented members, the Habitat Technicians, who live with the crew, dive with the crew, and pull off numerous feats of amazingness. Daily, the Liberty Star and its divers launch the submersibles and provide diving support for our breathing umbilicals. Additionally, ARB sends out boats with dive control and potting support. Potting is literally large metal vessels that bring down food and supplies and take away trash. 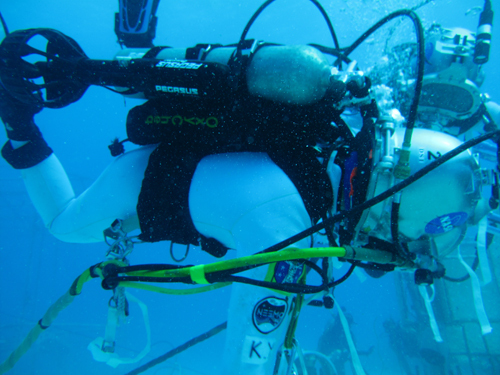 NASA has a boat that brings out our scientists, spacewalk specialists, and tool designers. 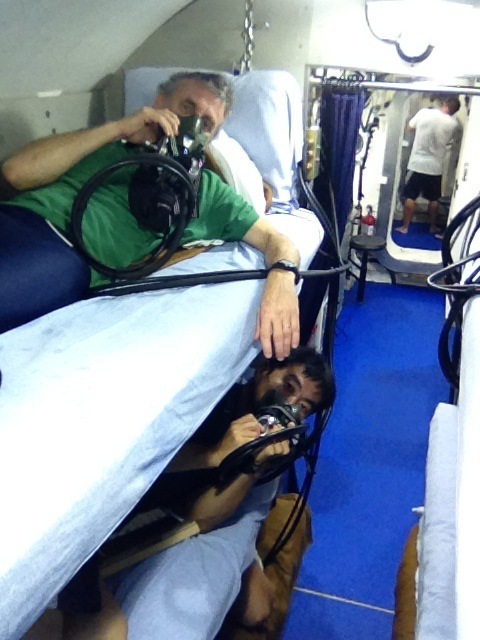 Down below, inside the habitat, is our crew of six. We execute the mission and provide real-time input. Each of these teams is essential; each is made of people who see the bigger picture of their role. To learn more about NEEMO, visit www.nasa.gov/neemo. Image at right: Astronaut/DeepWorker pilot Dr. Stan Love prepares for a communications check in the DeepWorker submersible. 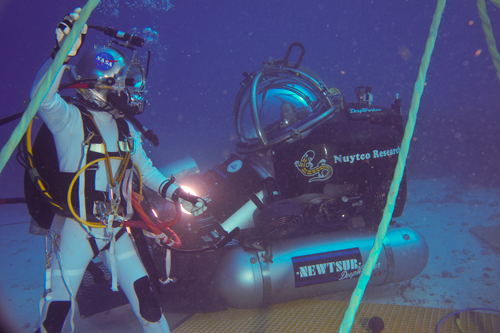 For the previous fewdays at NEEMO, the aquanaut crew has been moving around, taking geologic samples,and deploying science instruments as if they were astronauts in space suitsexploring a near-Earth asteroid. The buoyancy of the sea water counteractstheir body weight and makes them effectively weightless, as they would be neara small asteroid with very little gravitational pull. But it’s hard to workthat way. With no place to stand, it can take a lot of effort just to keep yourbody stable, and any work you do with your hands is clumsy and inefficient. But now that NEEMO’smarine science dives are completed, the DeepWorker submersibles are availableto work jointly with the aquanauts. The subs provide two tremendous advantagesto our “spacewalkers”: mobility and stability. Instead of theaquanauts having to move from one place to another by going hand-over-handalong a rope, they can just ride along with the submarine. Instead of the aquanautshaving to fight to keep their body stable with one hand while trying to douseful work with the other, they can clip their feet into a “footrestraint” attached to the front of the sub and have a solid place tostand, plus the freedom to work with both hands. 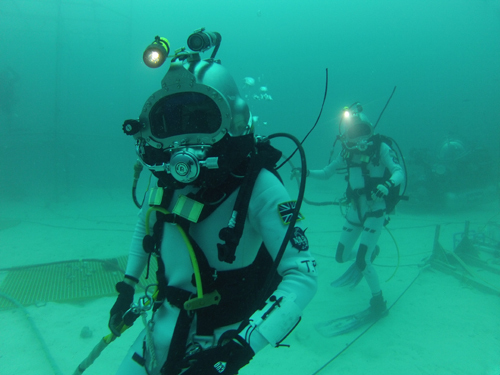 Part of our work at NEEMO thisyear is to quantitatively measure the time and effort it takes to do a widevariety of spacewalking tasks both with and without help from the subs. So Saturday morning,our first pair of sub pilots, Serena and Bill, got in the water and drove theirvehicles down to a sand patch near Aquarius. 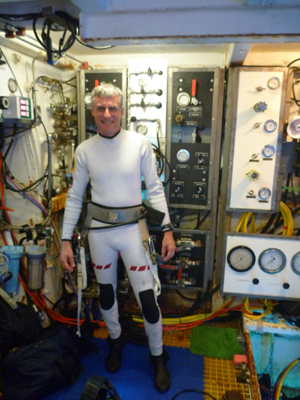 Divers hooked communication linesto their sub so they could talk and listen on the same channels as theaquanauts. We had done some preliminary testing on the communication and ithadn’t gone well. But that day, to everyone’s immense delight, thecommunication worked perfectly! 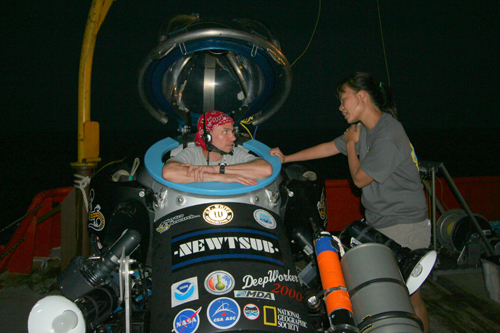 Serena and Bill did some test work with theaquanauts, and then returned to the surface. Image at right: An aquanaut adjusts umbilicals as astronaut/DeepWorker pilot Mike Gernhardt waits in the background. Mike Gernhardt and Iwere the sub pilots for the afternoon shift. 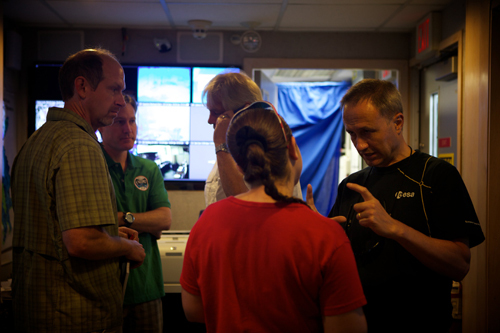 The plan was for Mike to do thefirst set of timed and scored tasks with the aquanauts while I observed andlistened. But things did not turn out that way, as often happens in operationslike NEEMO. Exploration is interesting in part because you do not know what youwill find. And work in places like space, or the sea, is interesting becauseenvironmental conditions like space radiation, weather, or sea state cansuddenly change the operation in ways that are hard to foresee. Out on Liberty Star, thelarge and beautiful ship that has come to support sub operations for the restof the mission, my sub was the first to go in the water. The crane hoisted meoff the deck and into the water and the lift hook disengaged. Immediately Iheard the voice of Jeff Heaton, the dive supervisor, on the radio: “Engagethrusters and move away from the ship!” The next second, the sub cabinjolted hard and tilted sharply, and I found myself wedged beneath the ship’sfantail between the rudders and the propellers (which had been turned offduring sub launching). I enabled the thrusters and gave full throttle in alldirections but the sub did not budge. Under the water my VHF radio could nottransmit or receive, and my location under the back of the ship was not accessibleto the through-water communication system we use while the subs are workingnear the sea floor. So I was on my own. What had happened wasthat my sub had been immediately caught by a strong current and pinned againstthe ship. With no way to escape on thrusters, and the swell continuing to bangthe sub against the hull, the only option was to do down. I flooded the sub’ssoft ballast tank, which seemed to take rather a long time, and finally droppeddown away from the very bad spot I’d been in. Once below the ship I got apartial transmission on the through-water comm telling me to descend to thebottom and hold there. This I did, putting in some forward thrust as well sothat the current would not take me far from the ship. I reached bottom onmixed sand and coral in about 90 feet of water and stayed there. The comm wasvery bad. Occasionally a call would make it through, but I wasn’t hearing muchand most of my transmissions went unanswered. I was able to tell Topside that Icould see no damage to the sub and that my cabin atmosphere was safe. Theyresponded with a recommendation to stay on bottom while they prepared torecover me. So I sat there and waited. I made test calls now and then,sometimes receiving an answer. The current strengthenedeven more and began to drag the sub along the bottom. I still didn’t want todrift away from the ship, so I maneuvered over to a rock and let the currenthold me in place against it. Nuytco Research, thecompany that owns the subs, has worked out emergency procedures for sub pilotsto carry out in case anything goes wrong on their flights. One of those casesis a loss of communication. For most dives, the instruction for the pilot is tostart a clock the first time an expected call is missed, and if an hour passeswith no communication they should bring the sub back to the surface. For ouroperation, since we were always going to be near the ship and in shallow waterand since communication was central to our job, we had agreed on a limit of 15minutes. I nearly got through acouple of 15-minute intervals, but then a partial call would make it throughand I reset the clock. While waiting I watched the fish moving around the sub.A spotted eagle ray, black with vivid white spots, swam by. I got out my cameraand took a few pictures. Finally thecommunication with the ship stopped entirely. I waited another 15 minutes, thengot on the thrusters. The current was still strong enough to make it hard todisengage from the rock I was next to. But the sub did come free, and I droveit away from the bottom. I kept an upward eye to make darn sure I didn’t comeup under the ship! I needn’t have worried.The sub surfaced about fifty yards from the Liberty Star. Immediately Jeff cameover the VHF radio and guided me back to the crane hook. Recovery was swift andefficient, and soon I was back on deck enjoying the breeze and asking whetherI’d made the right decisions. Everyone assured me that I had, and Jeffcommended me on having actually read and followed the lost-comm procedure.Evidently not everyone does that. He also said that from their perspective,they had put me in the water and I had disappeared instantly. I’m glad I wasn’tthe only one who felt that way! While Jeff and I werechatting, Mike from Nuytco came up and handed me a stubby, heavy, black plasticcylinder with a big blue-smeared bite taken off the edge of it. “Here’syour through-water comm transducer. Do you want to keep it?” Yes, I did. Iwill take it home and put it in my curio cabinet as a memento of an excitingday in the submarine. That ‘ducer sits high on the back of the sub, behind thepilot’s head, and it acts as the “antenna” for the system. If it’sbroken, no communication occurs. The blue color was bottom paint from theLiberty Star. Evidently the ‘ducer had taken the brunt of my impact with theship. That explained the bad communication. After that, the rest ofthe day was kind of anticlimactic. The Nuytco crew quickly installed a newthrough-water comm ‘ducer on my sub and made sure it was fit for duty. I dranka bottle of Gatorade to replace the fluid I’d lost from sweat (both fromtemperature and stress, no doubt), then hopped back in the cockpit to do our now-badly-delayedmission to the habitat, this time with both subs and no mishaps. We returned toshore at dusk, with take-out dinner plates kindly provided by the LibertyStar’s excellent cook. Another day thoroughly seized. 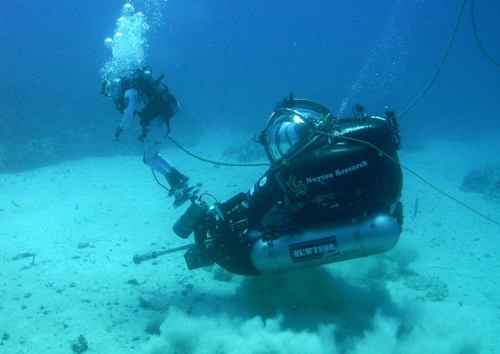 Image at right: Squyres performs an EVA while mounted to a DeepWorker sub piloted by NEEMO Mission Manager Bill Todd. 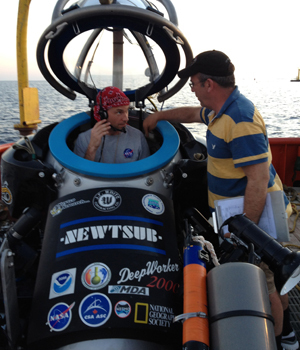 I was on the crew for NEEMO 15, back in October. It was a great mission, but it got cut short after just six days by a hurricane. (We were bummed, of course, but you don’t argue with a hurricane.) We got a lot of our tasks done, and we learned a lot. But the thing we all wanted to do most — dual operations between divers and submarines — we never got to. So why do we have submarines down here? The reason is that they simulate small spacecraft that could be used in conjunction with astronauts doing spacewalks at an asteroid. Spacewalks at an asteroid won’t be like spacewalks at the International Space Station… asteroids don’t come with handrails. So one idea is to take a small spacecraft to the asteroid, and let the astronauts fasten their feet to that spacecraft. The pilot in the spacecraft would position the astronaut, who would have both hands free to work on the asteroid. We tried that today, with Kimiya Yui and me as the astronauts and two small submarines, (with Serena Aunon and Bill Todd at the controls) as the spacecraft. And it worked. I mean, it really worked. The subs fly beautifully. Being mounted out on the front of one and working with the sub driver to fine-tune our path to our next location was drop-dead easy. And then, once we got where we were going, having our feet locked solidly to the sub was a great way to work. 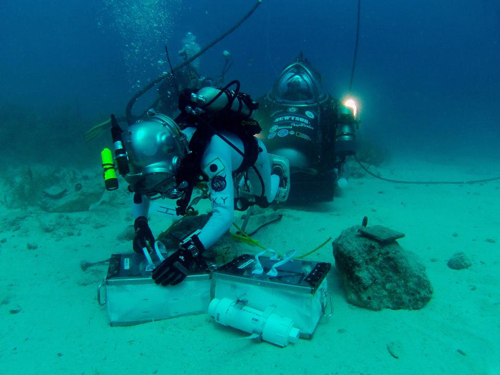 Image at right: Tim Peake and Steve Squyres translate across the ocean floor. With the previous night’s dive fresh our minds, the morning brought the prospect of something completely different but equally exciting…submersibles. Today was the day that the crew began to work with our ‘Space Exploration Vehicles’ in order to assess how they contribute to the efficiency of the tasks that we have been performing throughout the mission. By the time we were back in the water the light was fading slightly and the visibility dropping, so by the time the subs arrived we were once again treated to a completely surreal image of these two awesome floodlit machines slowly appearing out of the gloom. It really wasn’t that hard to remind ourselves that we were simulating an asteroid mission…the special effects have so far been worthy of an award! 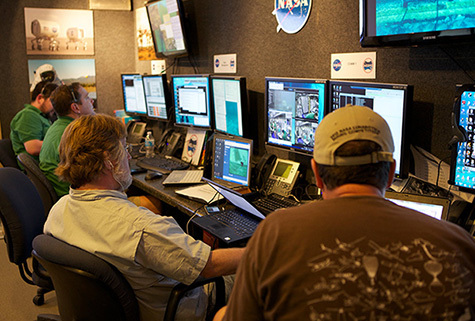 Image at right: The topside crew discuss communications delay scenarios in the mobile mission control center. Today, we didn’t have any EVAs. However, we had several interesting events today! 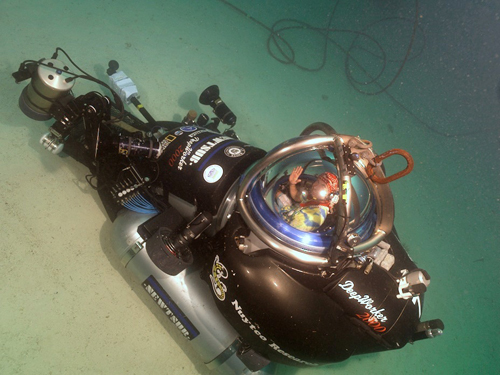 Our commander Dottie had live, underwater interviews while in her diving gear. Tim Peake and Steve Squyres had some interviews with a 50-second communication delay. Imagine if you asked a question, but you couldn’t get an answer for 100 seconds? It must make a really strange interview! These kinds of events were completely new to us, so we really enjoyed the challenge and also learned a lot from them. We know that during deep-space missions, communication with mission control on Earth will be delayed, and it will be very challenging for us to communicate during our missions. Of course, we had some hard training today. We had different types of emergency trainings, also with a communication delay! We got really good data, which will be valuable when we are going to explore an asteroid or Mars. We need to know what will be the most effective ways – and what kind of tools will be used – to comunicate effectively with a communication delay. By the way, do you think communication delay will affect our team work? Of course, it is hard to react to an unexpected situation without timely support from the ground team, which is an expert team. However, I felt the bond of the crew became much stronger. And more interestingly, I feel that not only crew but entire team’s bond became stronger! When teams overcome tough situations, the individual grows and team members will be bonded stronger! That is why we always need to keep a challenging and difficult mission! Sending humans to an asteroid is a tough mission, but I believe it is worth it! Image at right: Aquanaut Kimiya Yui performs tasks underwater while using a jetpack. 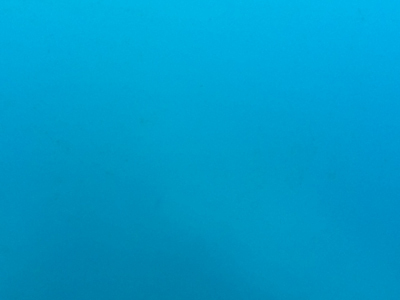 Under the water, the scenery is so beautiful, but we don’t have much time to enjoy this view when we are conducting EVAs. On Mission Day 4, we did various tasks which were almost the same as Mission Day 3. However, we started using a jet pack for our tasks. Have you ever dreamed about becoming a “Superman?” Yes! Our jet packs (simulated “Super SAFER,” packs that ISS astronauts use) allow us make this dream to come true. It’s cool, easy and smooth! Everyone liked this method of moving around. I felt as if I was flying around an asteroid! However, we can’t just enjoy flying… We are going to go to an asteroid to do science, research, work etc., not just for fun. So, we started doing our tasks by using this jet pack. Once we started to do our tasks, we didn’t like this method as much because it was hard to stay in the same place. Yes, it was fun but it was hard to do our tasks! We are testing various kinds of methods, and each one has its pros and cons. We are working really hard and take this really seriously because we all know that this kind of test can save billions of dollars in the future, if we conduct the test correctly and get accurate data. To get good data, the entire NEEMO team is cooperating with each other and doing their tasks. We are lucky, because we have a lot of skillful and professional people in this place that allow us to conduct this amazing mission. I hope our efforts will contribute to the future of human exploration, and I really hope future human exploration will be conducted under the international framework!